Sometimes, I am in the mood to eat a bit more healthy and when I am craving a meatless dinner, pasta is usually the dish that I cook. 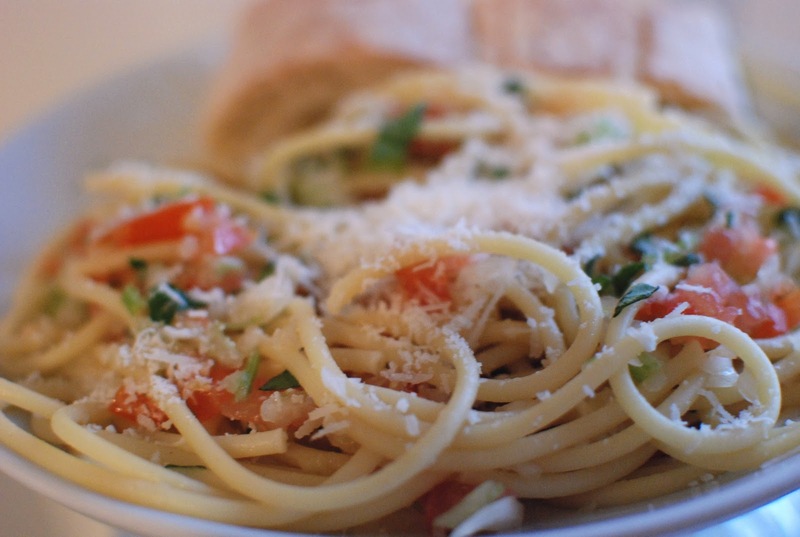 Here are two Italian pasta recipes that are so good I had a little plate of each this morning for breakfast after I made them. The one thing that they both have in common is that neither recipe contains any meat. The original recipes seemed complex. What I discovered is that the technique was written with so many disposable words cooking looked like a bigger task than it actually was. Indeed, I have observed this with many recipes so always take time to read through them and figure where you can create the shortcuts in order to make it manageable. Best of all…both take less than 30 minutes from start to table. Mix all of the ingredients except pasta, cheese and basil in a food processor until finely chopped. Cook spaghetti in boiling, salted water until al dente. Drain and reserve some pasta water. Mix the pasta with the sauce, adding a few spoonfuls of the pasta water. Serve with fresh leaves of basil and Pecorino Romano. Note: If you don’t like the raw onions and garlic, you can sauté the sauce for 5-7 minutes before mixing with the pasta. 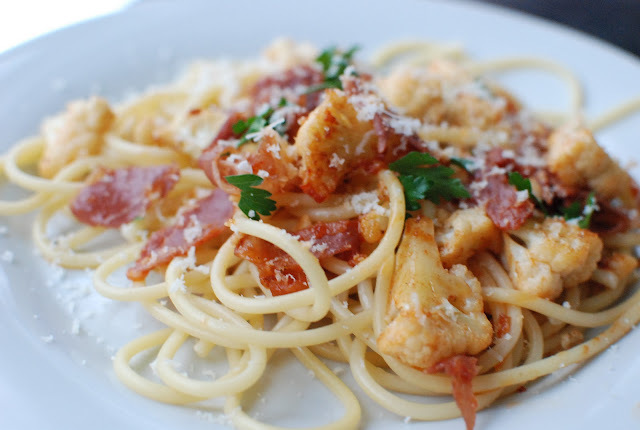 Here is another pasta recipe that features my favorite vegetable cauliflower. I loved the taste of prosciutto in this and it was the perfect compliment to the cauliflower. I did not have tomato concentrate so I used a few spoonfuls of homemade tomato soup. Heat olive oil in a large pan and brown garlic and prosciutto. Add cauliflower and tomato concentrate and cook over medium heat until tender. Cook spaghetti until al dente and save some of the pasta water. Drain. Add the spaghetti to the cauliflower mixture and add a small amount of the pasta water, as needed to create a creamy, not too thin sauce. Add chopped parsley and cheese.